Pour voir ce courriel en français, cliquez ici. On June 20, 2012, Ian Pearce, CEO of Xstrata Nickel, was elected Chair of MAC for a two-year term. Mr. Pearce replaces Doug Horswill, Senior Vice President of Teck Resources Limited who began his term in June 2010. Mr. Pearce has been an active member of the MAC Board since 2007. He is also a member of the Executive Committee and the Towards Sustainable Mining (TSM) Governance Team. In these roles, he supports the Association’s operations and provides guidance to MAC’s TSM initiative, which works to improve member performance in the areas of corporate social responsibility and the environment. In his new role, Mr. Pearce will focus on ensuring the industry is in a position to meet its challenges, capitalize on growth opportunities facing the sector and maintain Canada’s standard of excellence in environmental and social practices. Statistics Canada recently released gross domestic product (GDP) data for 2011, which shows national real GDP rose 2.6% last year. 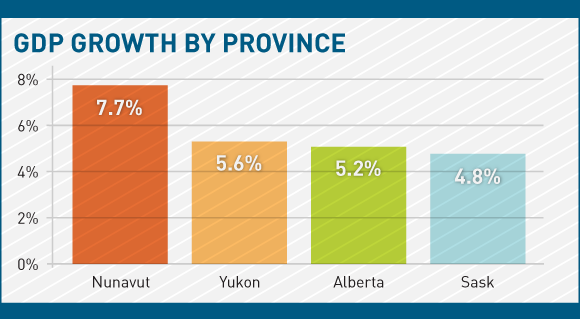 Alberta, Saskatchewan, Yukon and Nunavut led the pack in growth as a result of a surge in exploration, mining and related construction activities in these regions. The mining industry played a particularly strong role in the territories. In Nunavut, GDP increased 7.7% in 2011 as gold and silver ore mining output increased for the second consecutive year. Yukon experienced a 5.6% growth in GDP stemming from exploration for gold and silver hitting record levels. It was a different story in Northwest Territories, however, with GDP falling 5.5% in 2011 due to a drop in diamond mining. In the prairies, Alberta experienced the strongest economic performance among the provinces with GDP advancing 5.2% in 2011. This growth is largely attributed to higher energy prices which led to gains in exploration, and oil and gas extraction activity. In Saskatchewan, GDP rose 4.8% in 2011 owing to strong export demand, which led to higher output in non-metallic mineral mining (including potash), exploration and engineering construction activity. The impact the natural resource sectors have on the manufacturing industry has been widely debated in recent months. To add to the discussion, the Conference Board of Canada and the Business Development Bank of Canada released an interesting report that shows a positive link between the natural resources and manufacturing sectors. In June, BHP Billiton released its EKATI Diamond Mine 2011 Year in Review. Last year was particularly notable as it marked the 20th year since the discovery of diamonds in Canada’s North. 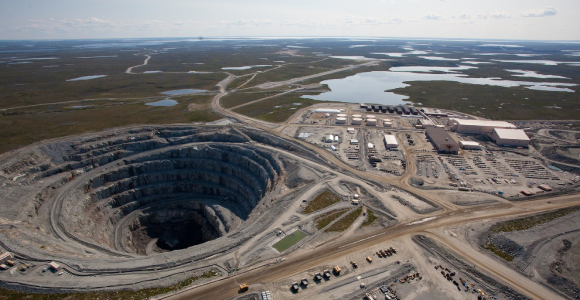 BHP Billiton’s EKATI Diamond Mine is Canada’s first surface and underground diamond mine, and is located about 300 kilometres northeast of Yellowknife and 200 kilometres south of the Arctic Circle. On average, EKATI produced more than three million carats of rough diamonds per year over the last three years. Annual sales represent about 3% of current world rough diamond supply by weight and about 11% by value. Over $1 million was committed over two years in meaningful Traditional Knowledge projects. Over $327 million was spent in 2011, bringing BHP Billiton’s investment in EKATI to $4.89 billion since operations began. 650 person years of employment for Northerners and Northern Aboriginals, exceeding the Environmental Impact Statement predictions. To review EKATI’s 2011 year-end results on safety, employment and community investments, download the report here. 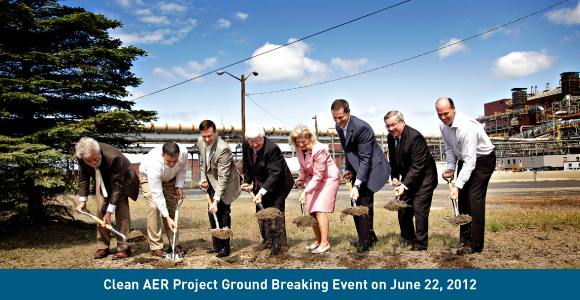 On June 22, 2012, Vale officially announced one of the largest single environmental investments in Ontario’s history – the Clean AER (Atmospheric Emissions Reduction) Project. The $2 billion project will reduce sulphur dioxide emissions at Vale’s smelter in Sudbury by an impressive 70% from current levels. It will also reduce dust and metals emissions by a further 35 to 40%. This project is not only a tremendous environmental achievement, but it will also spur significant economic benefits to the Greater Sudbury area. Before its scheduled completion at the end of 2015, Vale estimates the Clean AER Project will require about 8 million person-hours of additional labour. In fact, an estimated 1,300 additional workers will be needed on-site during the peak construction period. To learn more about how the Clean AER Project will reduce emissions, view this video. Corporate Knights has named ten MAC members in its 2012 Best 50 Corporate Citizens of Canada program. We congratulate Suncor Energy Inc., Kinross Gold Corporation, Teck Resources Ltd., Inmet Mining Corporation, Agnico-Eagle Mines Ltd., Cameco Corporation, IAMGOLD Corporation, Barrick Gold Corporation, Stantec Inc. and SNC-Lavalin Group Inc. for this important recognition. Each year, Corporate Knights measure companies on environmental, social and governance indicators found in public information. Indicators include energy, carbon and water productivity, and percentage of women and minorities on Boards. For more information, visit here. According to its newly released 2011 Year in Review, last year was a positive one for De Beers Canada. De Beers currently operates two diamond mines in Canada—the Snap Lake Mine in the Northwest Territories and the Victor Mine in northern Ontario. De Beers is also a joint venture partner in the Gahcho Kué Project in the Northwest Territories. De Beers Canada employed more than 1,000 people and injected over $500 million directly into the Canadian economy. Social investment totalled $4.9 million through cash, in-kind donations and staff time. Investment was focused on literacy, education and skills training for nearby communities. At Snap Lake, $161 million was spent on goods and services—68% of this was supplied by northern businesses. At Victor Mine, $101 million was spent on goods and services—57% of this was supplied by Aboriginal businesses. For more information on De Beers’ performance in areas of operations, finance, sustainability, and contributions to Canada and communities, download the report here. The Community of Interest (COI) Advisory Panel plays a key role in MAC’s Toward Sustainable Mining (TSM) program. The Panel brings together about 14 experts from Aboriginal, labour, NGO, financial and social organizations that monitor TSM’s progress and serve as external sources of knowledge. We also say goodbye and express our gratitude to many long-serving members who have completed their terms on the Panel. We thank you for your leadership and dedication to improving mining industry performance in environmental and social practices. Outgoing members include Roger Augustine, Richard Briggs, Ginger Gibson, Larry Haber, Brenda Kelley, Soha Kneen, Christy Marinig and Eric Morris. By bringing together individuals from different backgrounds, the Panel functions as an independent mechanism for analyzing TSM’s development and implementation. For more information on TSM and the COI Advisory Panel, please visit here. MAC is the national organization for the Canadian mining industry. Its members account for most of Canada’s production of base and precious metals, uranium, diamonds, steel making coal, mined oil sands and industrial minerals and are actively engaged in mineral exploration, mining, smelting, refining and semi-fabrication. Copyright © 2012 Mining Association of Canada, All rights reserved.